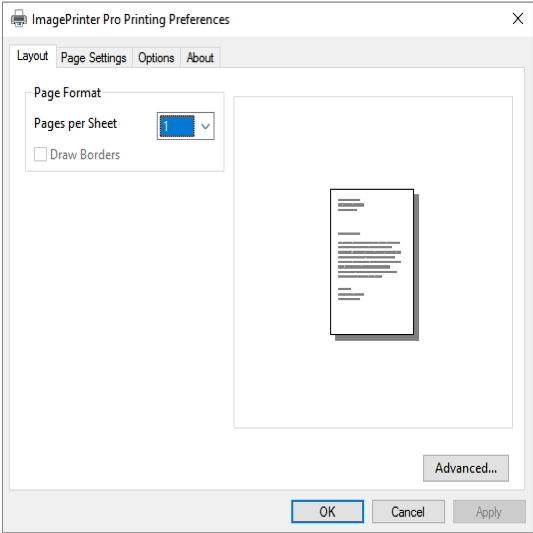 Open document in any application, which supports printing (image viewer, text editor etc). 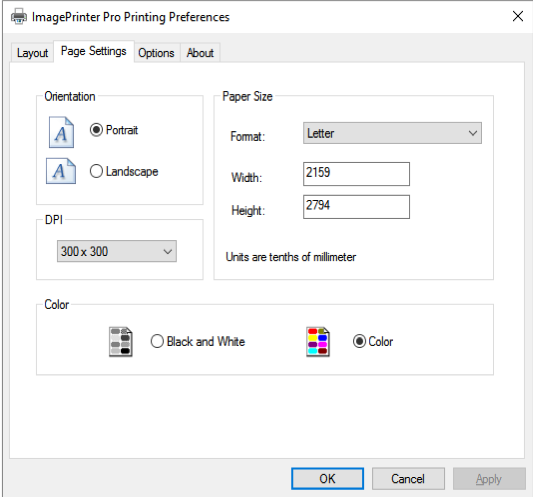 Choose Printer Settings… item in File menu. 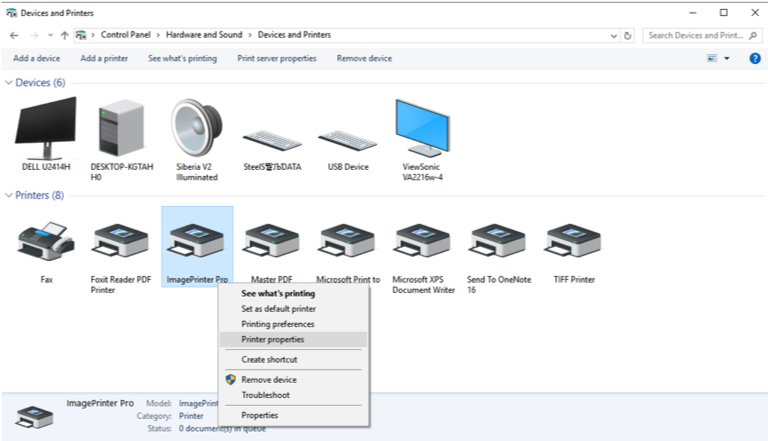 Or open Control Panel / Devices and Printers and right click ImagePrinter Pro. 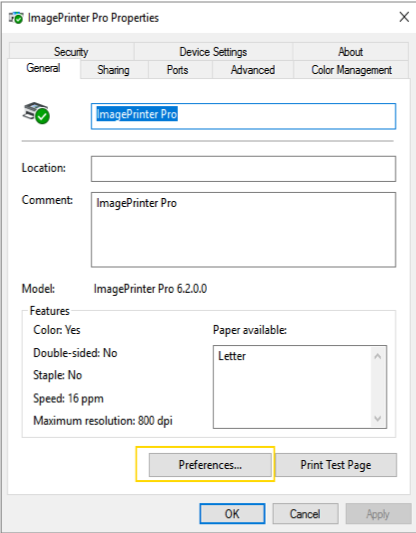 Then right click ImagePrinter Pro and choose Printer properties in the context menu. Press Preferences… button on General tab. In Print settings dialog window, you can set different printing options. Layout tab. Choose number of pages on single sheet. Page Settings tab. Choose page orientation and size, image resolution and printing color. Orientation Choose page orientation: Portrait – vertical. Landscape – horizontal. Paper Size Choose default or custom paper size: Format list of default paper formats (including letters and cards). Set custom paper size: Width – page width. Height – page height. Measurement unit is tenth of millimeter. DPI Set resolution for printed images. Color Set printing color: Black and White – black and white (grayscale) printing. Color – color printing. Options tab. Choose file format and path to save generated files. This tab is available for local printers only. File Format Choose file format for generated files. Output Path Saving path for generated files. 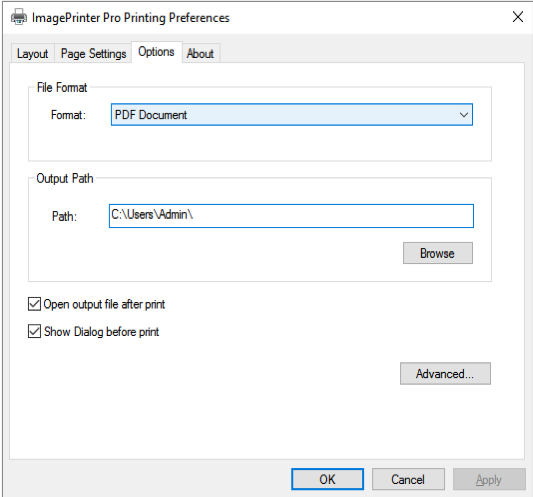 Open output file after print Check if you want to open output file right after printing. Show dialog before print Check to display a dialog window before printing. By default Save as… window is displayed. Press Advanced…button for extended settings. About contains information about application version, activation tools and update checking.